The press conference was followed on 30th July 2016 by a protest Dharna and a street Theatre depicting the atrocities on Dalits and challenging the people to rise up to the occasion. In spite of the heavy rains, around 200 people participated in the protest at RBI [Samvidhaan] Square, Nagpur at 11-00. am; they came from different walks of life, religious institutions, dalit organisations, like-minded organisations and NGOs, including men, women, and youth, to show their solidarity and to fight together against injustices faced by Dalits and all marginalised sections of our society in the country. Many Activists, Theatre artists and NGO leaders like Dr. Yashwant Manohar (Social activist), Mr. Rajesh Jadhav (Vidarbha Centre for Labour Concerns- NCCI), Dr. Dhanraj Dahat ( Ambedkarite Sahittik), Mr. E.M. Narwane ( Ambedkarite Poet), Mr. Surendra wankhede (Writer and Director), Mr. Virendra Ganvir (President of Bahujan Rangbhumi), Mr. Khemraj Bhoyar (Activist), Mr. Amit Ganvir ( Theatre artist and Activist) as well as Mr. Pradip Bansrior (Executive Secretary, NCCI Dalit and Tribal/Adivasi Concerns) addressed the gathering and urged the people not to remain silent regarding the atrocities and injustices happening in our society. Youth from different organisations along with Ms. Ngalaton Ningsen- NCCI Intern on Tribal and Adivasi Concerns, also shared their concerns and demanded stern action against the cow vigilante groups all over the country. Dr Yaswant Manohar, a Dalit activist, said that a majoritarian worldview, where might equals right and violence is considered as an acceptable substitute for dialogue and debate, is being rapidly rolled out across the country – in Parliament, in schools, in community organisations and government institutions. Our sense of being Indians, our pride in the rich diversity of beliefs, traditions and practices; our syncretistic culture and ways of life; our respect for difference; our ability to extract consensus from disagreement, debate and argument – all of these are being attacked and erased through brute force. Rajesh Jadhav, VCLC Coordinator, expressed that the saffron assault on educational and cultural institutions has been stepped up. People with no intellectual or professional qualifications other than their loyalty to the Hindutva agenda are being parachuted into position as VCs of universities, directors of national institutions for the promotion of the arts and sciences, heads of institutions of research, chairs of professional and technical bodies. The saffron worldview, where myth masquerades as history, where belief is elevated to knowledge, where superstition overtakes rationality, is actively promoted by these “thought-leaders” who are guided and supervised by the backroom vigilante boys of the RSS. 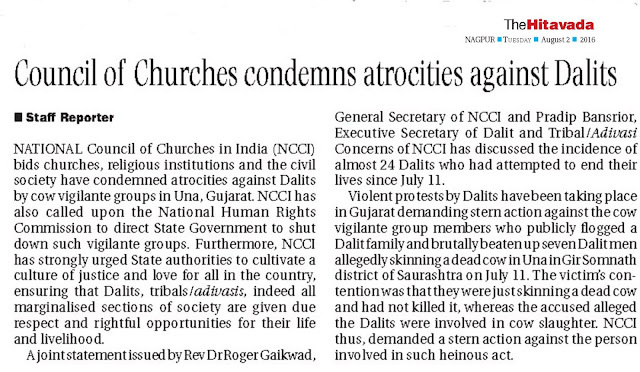 Pradeep Bansrior, Executive Secretary of Dalit and Tribal/Adivasi Concerns, NCCI voiced that the Una atrocity is a crackdown on democratic dissent and freedom of expression. The right to protest is brutally stripped off of even the pretense of legality. Student movements, Dalit movements, women's movements, movements against corporate loot of national resources, are all being branded attacked as anti-national. The benchmark of patriotism has been re-calibrated to a simple formula where dissent equals betrayal of the nation. Unthinking subservience and blind obedience to the saffron diktat are the only acceptable markers of Indian-ness. Any deviation is quickly condemned and crushed. The right wing agencies in Una, Gujarat, Haryana, Maharashtra and elsewhere are designing to terrorize Dalits all over India. This stark reality has unleashed a huge wave of protests and resistance and has brought millions of people out on the streets. The Samvidhan Square protest is a sign of hope and a signal of solidarity. Let us not forget that every attempt to crush this resistance cannot silence the voices of protest or weaken the strength of people's resistance. Let us not forget that the struggle has created new solidarities among people's movements, students, workers groups, farmers, intellectuals, and political activists to reclaim democratic space and build the foundations of new struggles.